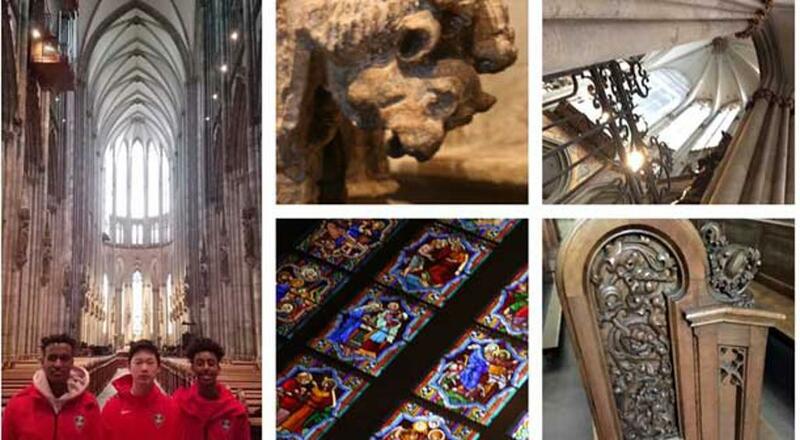 Today, we started the day with a tour of downtown Cologne, known here as Köln (pronounced ‘Cone’), where we had two and half hours to see and experience this beautiful city along the Rhine River with its famous Cathedral and charming streets. The bus dropped us off near Köln’s Cathedral, known as Kölner Dom or just Dom (pronounced ‘dome’) for short. Our bus driver was very proud of Kölner Dom and encouraged us all to go inside for a look because its “Beauty was absolute!” We were pleased that the majority of our boys took his suggestion because the interior of the church was just as impressive as the towering exterior, not at all surprising since the Cathedral has been a designated UNESCO World Heritage Site since 1996. From the church, we headed down the stone cobble streets to take in all the sights and sounds, shops and stores. Street crews were busy cleaning up confetti and other remnants of the Carnival from the day and night before in celebration of Rose Monday. Known locally as Rosenmontag, Rose Monday is an observed holiday here marking the last Monday before Ash Wednesday and the start of Lent. It is heavily celebrated with parades, music and fanfare which one shop owner excitedly described as Köln’s Mardi Gras, Fourth of July, Christmas and New Year’s all rolled into one. At 12:30 p.m., we boarded the bus back to the Wedau complex. 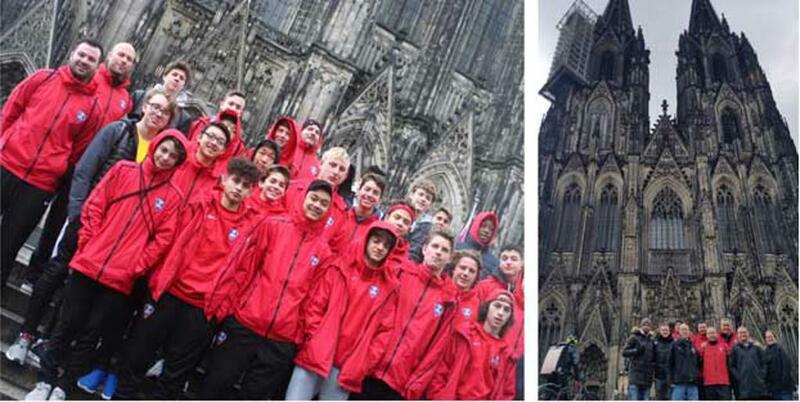 During the ride, Coach Chato and my wife, Jeanne, spoke with our boys about the Cathedral, asking for their impressions to engage them in conversation about Gothic architecture and the cultural significance of landmarks such as Kölner Dom. They discussed how landmarks like these aren’t just about religion and how they can be studied as a reflection of the people who built it. 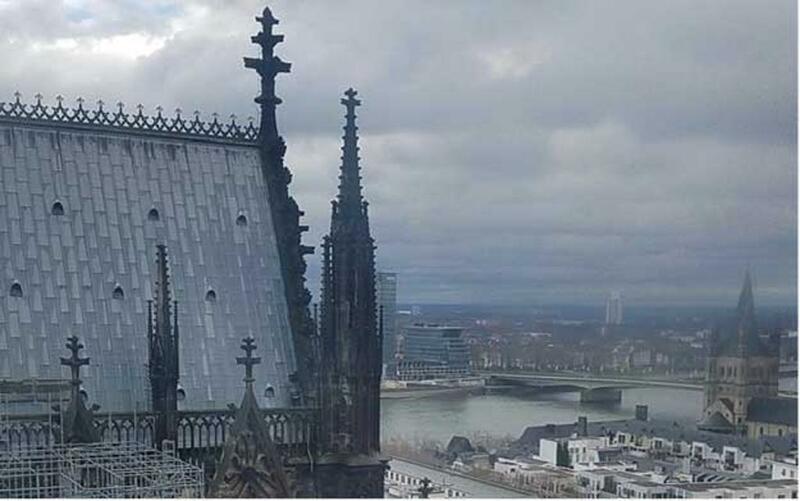 They talked about how medieval tools and technology were limited compared to what we have today, but through their knowledge and practical application of geometry and skilled masonry, they were able to build these timeless masterpieces. Woodworking talent traditionally dominates this region of Germany and in Kölner Dom every pew in the Cathedral depicts its own unique representation of a flora specimen of Germany, a sort of craftsman signature. They discussed how descendants of master artisans from this region became the master carvers and furniture makers in colonial and Victorian America and how they could see a prominent example of that kind of talent and pedigree in the horses of Cafesjian’s Carousel outside Como Zoo in St. Paul. Our boys actively participated in the discussion, frequently drawing on their knowledge of history, and it was wonderful to see and hear them making connections between what they had seen, what they already knew and what they were now learning. Once back at the Wedau complex, our teams met for lunch and our ‘02’s and ‘04’s prepared for their evening game vs. Wuppertaler SV who played three seasons in the Bundesliga from 1972–75 and currently play in the Regionalliga. 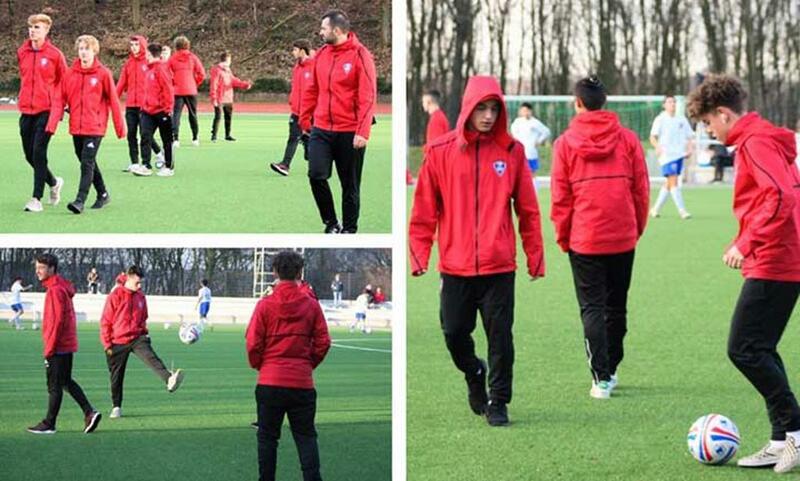 Our ‘03’s stayed back at Wedau to train in preparation for Thursday’s game vs. Oberhausen. Our ’02 and ’04 teams promptly boarded the bus at 3:30 p.m. for the 45-minute trip to the town of Wuppertal which we learned is named after the Wupper River, which is a tributary to the Rhine, and its surrounding valley (“tal” in German). Our bus parked at the bottom of a wooded hillside and we climbed the long stairway up to the Wuppertaler SV Complex where we were greeted by both parents and players. The field in Wuppertal is unique. Cut into the hillside near the crest, it has a clubhouse at the north end behind the field and stadium lighting in all four corners which created a really nice playing environment and experience for our boys. We arrived early giving our ‘02’s, who were scheduled to play the second game of the night, time to practice and get familiar with Wuppertaler SV’s new artificial turf field ahead of our ‘04’s game. Meanwhile, our 04’s went to the locker room on the ground level of the clubhouse to change into their uniforms before warming up with their coaches ahead of the game. Hoping to build on their previous performance, our ‘04’s started their game with confidence and a healthy measure of respect having learned much from the previous game’s style of play, authentically typical of German clubs. After creating a few chances, Wuppertaler SV managed to get on the board first. 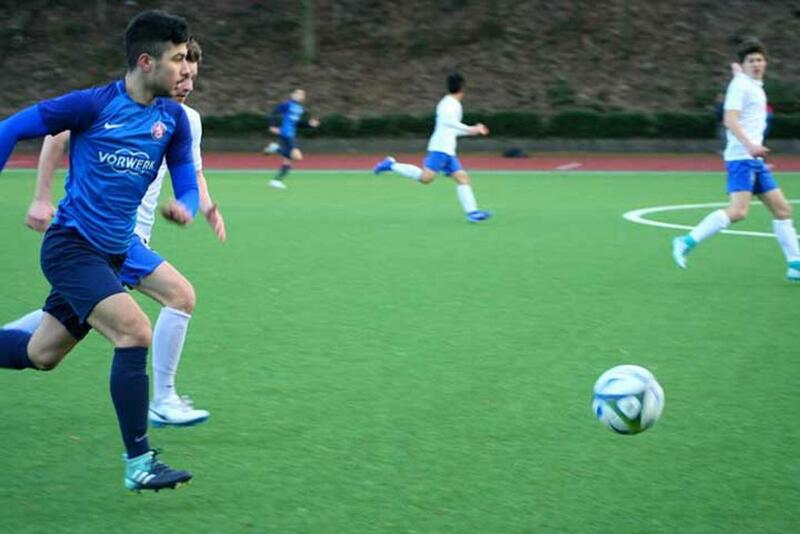 Our boys responded tenaciously, increasing their pressure on Wuppertaler SV and answering with their first goal. They continued to stick with it and with five minutes left in the game, thanks to our team’s unrelenting pressure and our players’ determination and skill, Minnesota confidently drove the ball into Wuppertaler SV’s net; unequivocally the best goal of this trip by any of our Minnesota ODP teams. After the game, the boys gave out pins and awarded a scarf to their opponent’s MVP of the game, taking a moment for a group photo before heading into the clubhouse to enjoy a delicious dinner. Meanwhile, our ‘02’s eagerly awaited their opportunity to play Wuppertaler SV since their last game was on Sunday. Characteristic of the respect and courtesy we have seen from our players from the start of this trip, our ‘02’s sat together in the stands to support and watch our ‘04’s game ahead of their own kickoff. When it was our ‘02’s turn to take the field, they were ready to play and immediately found themselves in a very competitive, fast-paced and exciting game. Like their younger counterparts, our ‘02’s made impressive adjustments to their play in anticipation of what the German players would be bringing to the field and the result was a game that could have gone either way against a team that is the top in their league and in prime position to be promoted into the youth Bundesliga league next season. The coaches and our boys felt good about their on-field performance, they presented their opponents with MYSA pins and an MYSA MVP scarf before heading to dinner in the clubhouse. By the time we boarded the bus it was past 9:00 p.m. and we enjoyed a quiet and restful ride back to Wedau Complex. Today was a great day in every sense. We’re seeing exciting things happening with all three teams. The development and adjustments these players have made in a matter of days is impressive and speaks to their physical and mental abilities both as individual athletes and as teams. We are very pleased and are looking forward to seeing what tomorrow brings.